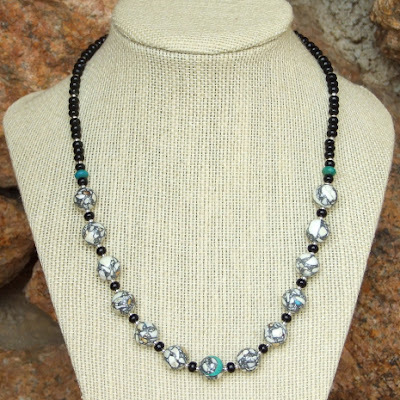 This superb beaded necklace with pendant is made with a combination of highly polished sardonyx and onyx gemstones and sterling silver beads. The sardonyx gemstones are star cut faceted exhibiting various white and gray bands and stripes. There are also hints of brown, which is also characteristic of this gemstone. 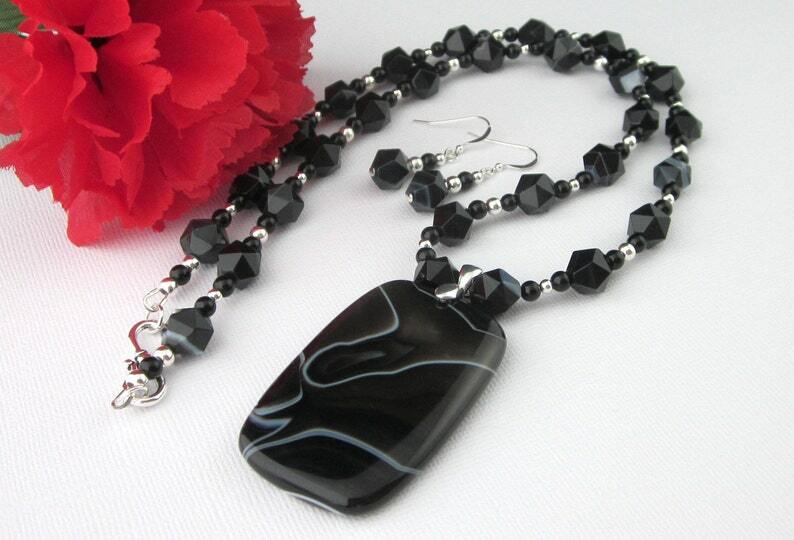 The smaller round onyx gemstones are solid black. 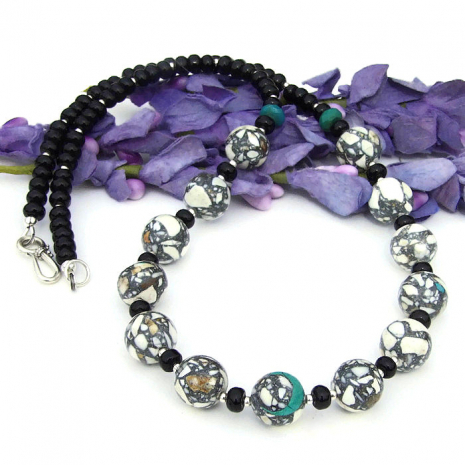 Between the onyx gemstones are small round sterling silver beads alternated in two different sizes. 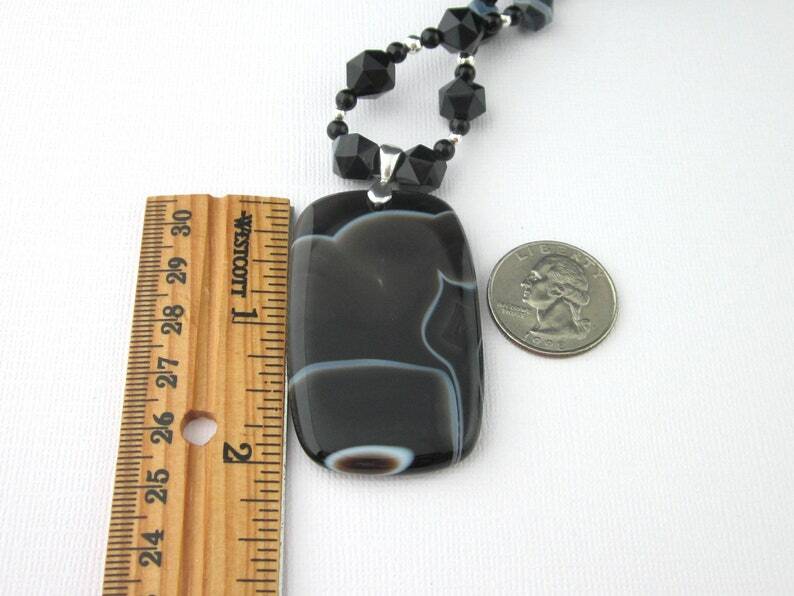 See the size of the gemstones, pendant, silver beads, and length of the necklace below. The glossy, large size sardonyx pendant depicts different scenes on each side. One side looks like a peninsula and the other has swirls. You can wear the necklace with either side of the pendant facing forward. The pendant's bail is antiqued silver and the necklace fastens with an antiqued silver “S” clasp fastener. All other findings are sterling silver. Beaded with top quality 49 Strands beading wire and double crimped for durability. Earrings are included. They have sterling silver French style ear wires. See length below. For your convenience, included is a white cotton filled gift box. So nice to use for gift giving! Please view all 10 photos including both sides of the pendant, size comparison to a ruler and a close up of the gemstones in model's hand. Shipped USPS First Class including insurance coverage (USA). See more handmade gemstone necklaces at The Singing Beader. Glossy transparent aqua blue handmade lampwork glass diamond beads with double helix aurae metallic band and a shiny bead finish. Beautiful glass diamond band beads! 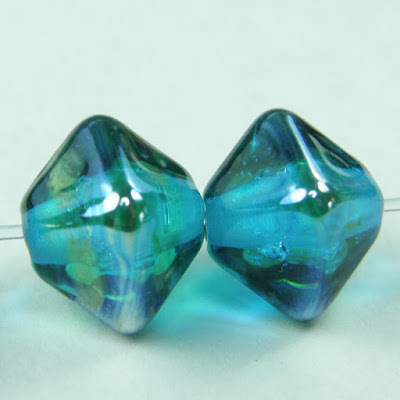 These beautiful handmade lampwork beads were made using aqua blue glass. I added a double helix aurae glass to create a metallic band and pressed into a diamond shaped bead. 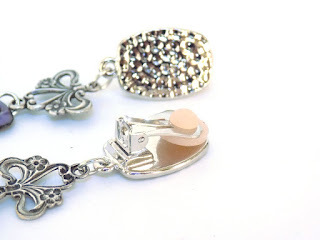 These trendy pressed beads have a shiny glass bead finish. 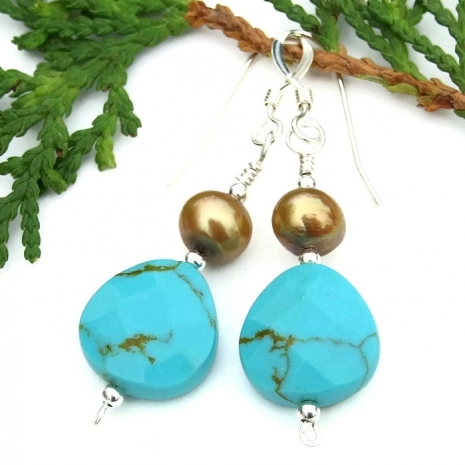 The "Tantalizing Turquoise" handmade earrings were created with faceted genuine turquoise teardrops, freshwater pearls and sterling silver - gift idea for women. 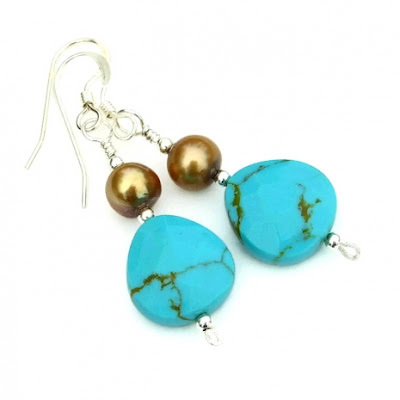 The beautiful turquoise teardrops are faceted, adding subtle sparkle to the earring design. 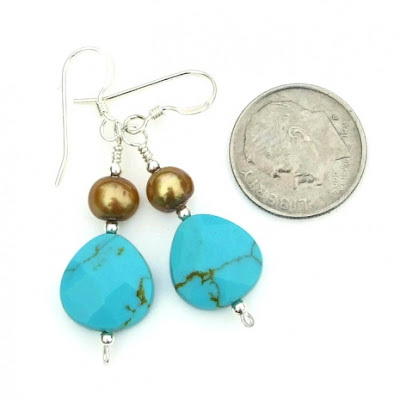 The turquoise teardrops and pearls handmade earrings shown with a dime for size comparison. Mr. Moose Dog and I thank you for the shares of these earrings! These sea turtle earrings are the perfect accessory to take with you on your trip to Florida or anywhere else that the tropical warm breezes play and the ocean sings. These earrings have been made from a sweet pair of dainty sea turtles and adorned with 6mm Swarovski elements in the color of the deep Atlantic Ocean because nothing sparkles more than Swarovski unless it is the sun on the waves. Every time you move your head, these sea turtles move, so they make great dancing earrings for those nights out on the town as you enjoy your tropical vacation. Also make great earrings for those of us lucky enough to live here all year long. When you buy earrings for women, you want a pair that is going to accent your looks like these dainty earrings do. They make perfect earring gifts for girls, as well. The earwires are plated metal and come with a stopper, so you can wear them as tight or as loose as you like. Also available as a pierced look pair. 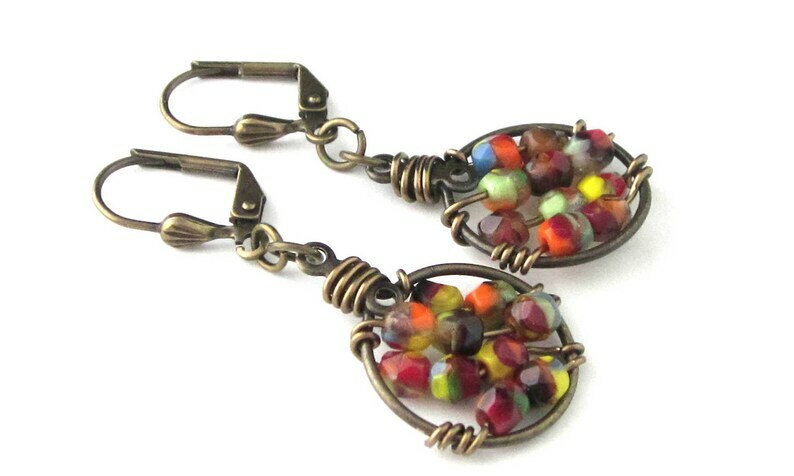 These boho, rustic style earrings are made with multi-colored faceted Czech glass crystals and small metal bronze plated hoop forms. The Czech crystals are hand wire wrapped inside the hoops. The wire wrapping is free-form meaning that each earring may not turn out exactly alike. Each of the Czech crystals has a variety of colors, primarily dark red, orange, yellow and green. The lever back earring wires are antiqued brass featuring a small shell design on the front. Earrings come with an organza drawstring pouch. So nice for gift giving! See all photos showing details included size reference with a dime, a ruler, and in model's hand. Please read The Singing Beader's policies for more details. Shipping cost is included in the price (USA) USPS first class. 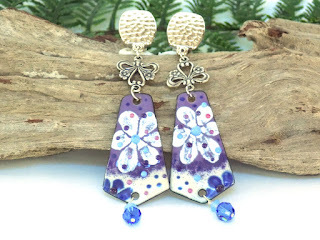 Dress up your look with these beautiful purple flower earrings. 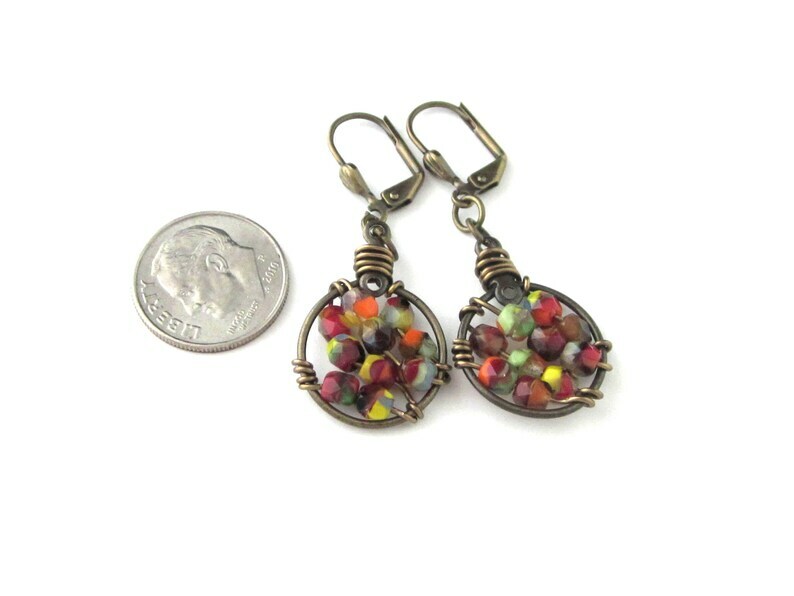 These boho clip on earrings are very comfortable earrings to wear. They are comfortable because the clip backs have soft rubber inserts. Floral jewelry makes a great gift for her. 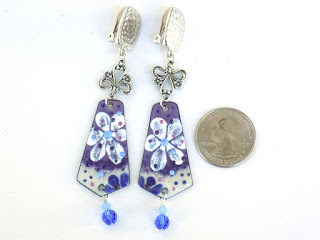 This lovely pair of earrings features artisan made enamel components. I have highlighted them with blue and opal Swarovski crystal dangles. 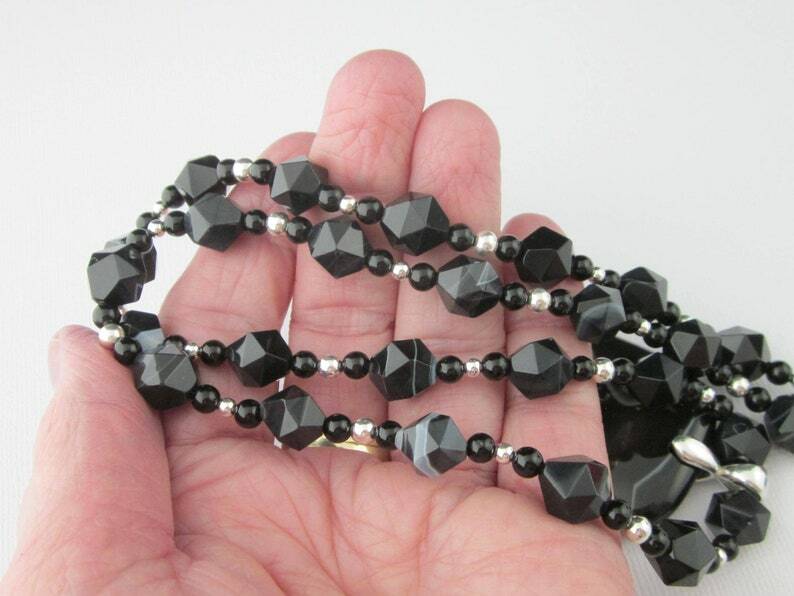 They are 3.5 inches long from the top of the clip backs to the bottom of the crystal beads. These earrings are designed and handmade by me, Sharon, of Blonde Peach Jewelry. They will arrive in an attractive organza bag that is great for storage and gift giving. 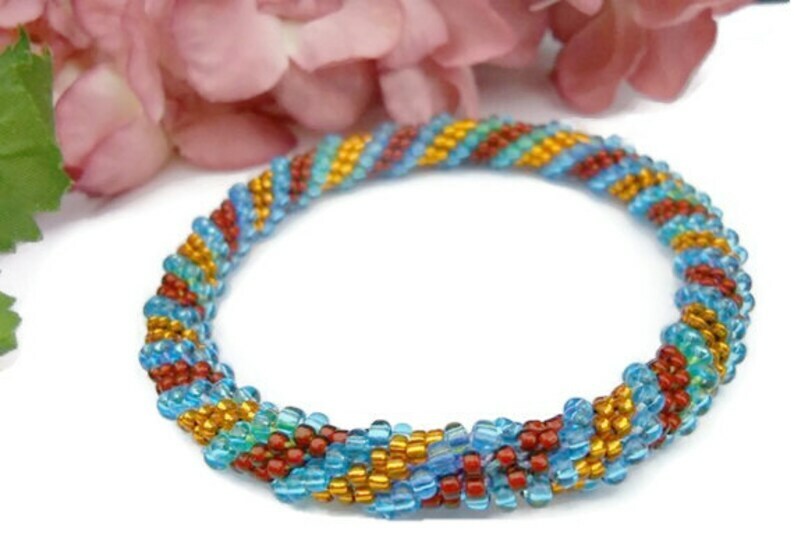 This crochet bead bangle bracelet blue gold mahogany uses 11/0 Rocaille beads. The inside diameter is approx. 7 inches. It slides or rolls onto your wrist. 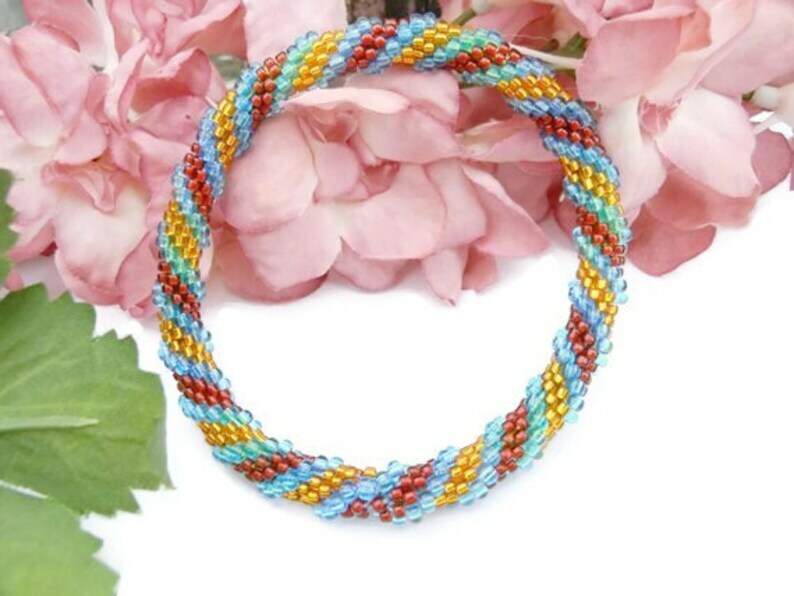 This bracelet will fit an 8-inch hand, meaning if you measure around the widest part of your hand and it is around 8 inches then this bracelet will fit. It does stretch just a little so it will roll over your hand nicely. This bracelet was hand crocheted using 100% Egyptian cotton thread and 11/0 Rocaille beads. By string the beads one at a time in a set sequence they are then crocheted into a spiral rope then the ends are sewn together to make the bangle bracelet. These gorgeous beads are made using glossy transparent pale aqua blue glass. I added a splash of .999 fine silver wrapped around them. These pale aqua blue beads have a glossy glass bead finish. 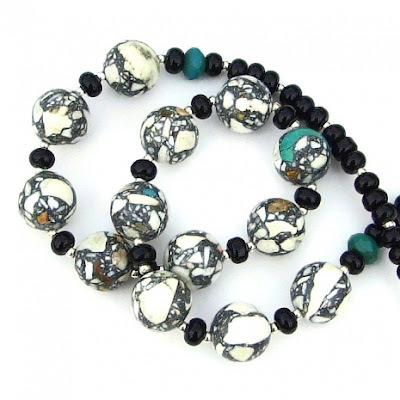 The unique "Medley" handmade necklace features mosaic magnesite, genuine turquoise and black onyx - jewelry gift for women. A closeup photo of the beautiful mosaic magnesite composite rounds. The "Medley" handmade necklace shown on a jewelry bust. The Lizard Chasing Moose and I thank you for the shares of this necklace! If you love collecting shells on the beach, then these dainty sand dollar earrings are a special treat. These fun charm earrings are for anyone who loves the ocean, whether they live there or not. The 4mm blue Swarovski crystal just adds sparkle to the earrings whenever the light hits them. Perfect for lunch with the girls or dancing the night away in Miami. When you buy earrings for women, you want a pair that is going to accent your looks like these dainty earrings do. They make perfect earring gifts for girls, too.